COLUMBUS, Ohio--(BUSINESS WIRE)--BRIO Tuscan Grille has introduced three lunch features for $8.95. Offered Monday through Friday from 11 am to 3 pm. Selections include entrée sized salads, specialty items, pastas and flatbreads. “Spring is a wonderful time of year to highlight seasonal ingredients. With so many flavorful options, the new lunch specials highlight the best of the season. We are excited to introduce these flavorful options at a great value to all of our guests,” says Brian O’Malley, Chief Operating Officer. 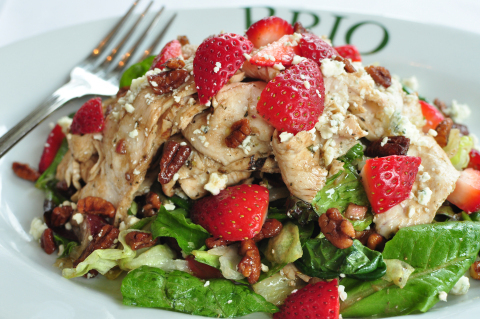 Several entrée options from which to choose will be available weekly, including the Strawberry Balsamic Chicken Salad. Mixed greens tossed with grilled chicken, grapes, candied pecans, Gorgonzola and herb vinaigrette. If pasta is what you crave try the Pasta Yandolino-rigatoni noodles tossed with grilled chicken, spinach, mushrooms, Feta and diced tomato in a light bercy topped with pesto bread crumbs. Also included in the lunch selections are Chef’s Weekly Select Flatbread and Salad combination features. Lunch specials change weekly so visit us online at www.BrioItalian.com to view our weekly menu and be sure to stop in often to discover your new favorite! BRIO (meaning “lively” or “full of life”) is an upscale affordable restaurant serving authentic, northern Italian cuisine. The subtitle, “Tuscan Grille” is descriptive in the menu that features wood-grilled and oven-roasted steaks, chops and seafood, similar to what one would find in an authentic ristorante in Tuscany. BRIO is part of Columbus-based BRAVO|BRIO Restaurant Group (NASDAQ: BBRG). Founded in 1992, BBRG currently operates more than 100 restaurants including BRAVO! Cucina Italiana, BRIO Tuscan Grille and Bon Vie Bistro. Please visit the website for BRIO locations at www.brioitalian.com and follow the restaurant on Twitter (twitter.com/brioitalian) and Facebook (facebook.com/brioitalian).